My kids love blankets. It is not uncommon to find several blankets around the house. My daughter loves to pull out blankets and use them for everything from a classroom to a cover. The kids like to cover up with the throws that we keep on the back of the sofa on Saturday morning when they are watching shows. When we watch movies, we have a stack of blankets in the media room that we can use (of course, if I use one it doubles the likelihood of me falling asleep during the movie!). So, when I learned about the Ponchillow, I knew that it would be a hit at my house. A Ponchillow is a cross between a poncho and a pillow - their slogan is "Never Forget Your Pillow". The hooded "blanket" has a front pocket (and an inside one too) and a pillow attached just below the hood. The Ponchillow is available in both adult and children sizes (they also have a Pupchillow for your furry friend) and several patterns. The fleece material definitely can keep you warm. We received a royal blue kids Ponchillow. As soon as it arrived, both kids were ready to take a turn trying it on. As you can see, when their knees are pulled up, the Ponchillow is long enough to cover them fully. On New Year's Eve, as my son attempted to stay up to see the big ball drop, he was chilly and reached for the Ponchillow to stay warm and cozy. I was glad to see a sustained interest in the product. I really like the idea of the Ponchillow. The fact that you can wear it makes it easier to bring along (no one has to carry it). I'm thinking too that it could be an interesting solution to a sleepy child in the car. Since our son is out of car seats altogether and my daughter uses a backless booster, they no longer have the luxury of a carseat side to lean against. We have travel pillows, but there isn't an easy way to keep them in place. With the Ponchillow, you have a blanket and a pillow, all in one - and the pillow won't fall on the floor while your child sleeps. Pochillow is providing a special offer to A Busy Mom of Two readers - you can use the promo code ABUSYMOMOFTWO to get one free Ponchillow when you buy two. Offer expires on March 1st. 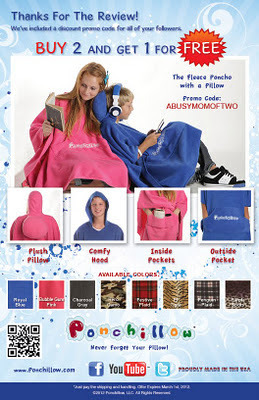 The kids Ponchillow retails for $24.99 and the adult Ponchillow for $29.99. You can purchase your Ponchillow direct. They are also featured in the January 2012 edition of SkyMall Magazine. In addition, right now, Ponchillow is hosting a giveaway on their site. You can find the Ponchillow giveaway here. No compensation was received for this post. A Ponchillow and information was provided by Ponchillow for this review. All opinions expressed are my own or that of my family.